Located in the Serendib Business Class Lounge of SriLankan Airlines at the Colombo International Airport, this Siddhalepa Ayurveda Spa lets weary travellers enjoy complimentary treatments overseen by experienced therapists, to leave you feeling re-energised and refreshed. Enjoying a central location in Colombo’s Cinnamon Gardens, this luxurious urban spa features authentic Ayurveda treatments that help you find that inner balance. 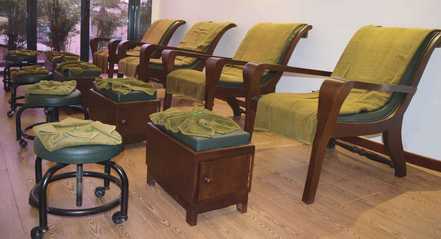 Apart from specific treatments that purify the system & relieve stress, the spa also offers full day packages. A place to unwind and find true rejuvenation away from the bustling city, the Siddhalepa Ayurveda Day Spa provides a space filled with tranquilly. Experience an array of holistic treatments enriched by natural oils and balms that help to promote total wellness. Our newest spa chain addition, CHI, The Spa at Shangri-La's Hambantota Resort & Spa offers a luxurious wellness escape in the deep south. The spa features specialist Ayurveda doctors who develop customised treatments specifically to help you find true healing & rejuvenation. Anarva Ayurveda spa offers guests a truly rejuvenating experience delivered by professional Ayurveda doctors. Positioned conveniently on the 2nd floor, the spa is complete with 6 treatment rooms all of which open out to the majestic Indian Ocean providing a soothing setting in which to forget your cares and enjoy a stress-free personal pampering. The spa also features a sauna & a foot spa designed using contemporary architecture making guests feel welcome. All our treatments & therapies are delivered with utmost care using ISO certified products by a set of well-experienced doctors & therapists who are committed to providing guests with a wholesome wellness experience.